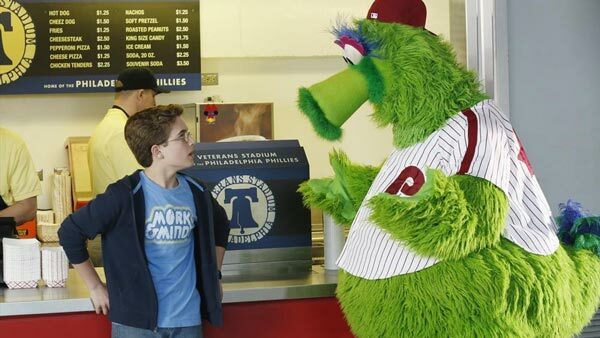 PHILADELPHIA (WPVI) -- The Goldbergs are coming to Citizens Bank Park. Series creator and Jenkintown-native Adam F. Goldberg will be in attendance along with his real-life brother Barry. Joining them will be Troy Gentile, who plays Barry on the show. Gentile will throw out the first pitch before the game between the Phillies and the Oakland A's. But the rad fun doesn't end there. During the game, Phillies fans will be able to view Phillies-themed clips from the show will be featured on PhanaVision throughout the game. Students from the William Penn Charter School, the inspiration behind the show's William Penn Academy, will sing "Take Me Out to the Ballgame" in the 7th inning. And all fans will receive a retro Phillies/Goldbergs slap bracelet! "To this very day, my brother Barry's biggest complaint is that my dad didn't get him tickets to see the Phillies in the 1980 World Series. It's mind-blowing that my childhood team is holding a night for 'The Goldbergs' and I will watch my brother throw out the ceremonial first pitch. 11-year-old Barry would never believe it," Adam F. Goldberg said. "I wish my Dad was here to see it, but at least I have tons of great memories going to Phillies games with him back in 1980something." 'The Goldbergs' airs weeknights at 6 & 7:30 p.m. on PHL17 and new episodes air Wednesdays at 8 p.m. on 6abc.